In a small saucepan, heat up a tablespoon of oil. Add the sliced shallot and cook until the oil has a nice fragrance. Remove from the heat. Set aside. Use fresh, good looking shrimp. If the product is frozen, it's not necessary to thaw it. Remove and discard the head of the shrimp. 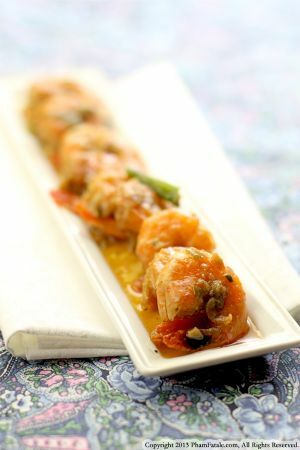 Carefully remove the black vein of the shrimp using a sharp, hook-like pairing knife; make sure the shells and tails remain on though. Rinse the shrimp under cold tap water. Pat dry using a paper towel. There should be as little water as possible. Repeat the same procedure for each shrimp. This step is tedious but essential for good results. Spread all the shrimp on a large tray. Generously coat the shrimp with 2 teaspoons of garlic. Sprinkle the spices from the mortar and pestle. Add about 2 teaspoons of the shallot-infused oil and mix all the shrimp together. Plastic wrap and let the shrimp marinate for 15-20 minutes in the refrigerator. In a wide, non-stick pot, heat the remaining oil over high heat. The oil should be sizzling hot, near the smoke point. Add the rest of the minced garlic and let the garlic get slightly golden (don't burn it). Pour the shrimp in all at once and spread the shrimp evenly all over the pan. 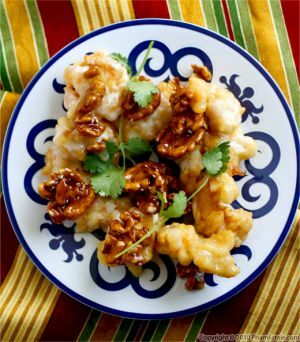 Each shrimp should be in complete direct contact with the pan to thoroughly caramelize. One pound of shrimp should be enough so that no shrimp is on top of another. Keep your stove at the highest temperature. 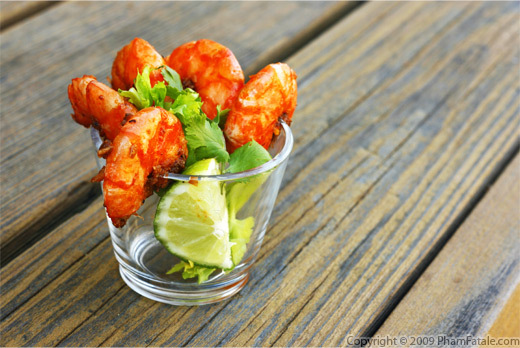 Flip each shrimp using chopsticks (or tongs) to prevent them from burning and so they brown evenly. Cook for another 3-4 minutes (keep flipping each shrimp). At the end, the pan should be dry and have remnants of shrimp-infused garlic at the bottom and each leg of the shrimp should have caramelized garlic stuck to it. Transfer to a platter. 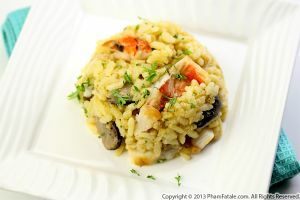 In the same pot, heat the remaining olive oil and add the rice, paprika and butter. 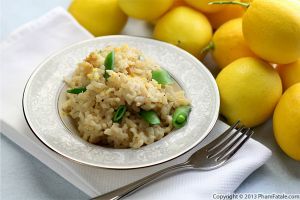 Make sure the grains of rice are well coated. Add 2 cups of warm broth. Be sure to scrape the flavorful bits and pieces from the bottom of the pot. After bringing the liquid to a boil, lower the heat to medium-low and cook for about 10 minutes. Check the liquid and periodically add 1 cup of warm broth as soon as the previous liquid has been absorbed. Add the rest of the spices and simmer for another 30 minutes. Reserve a few shrimp and shell the rest. Cut them into small chunks. Sprinkle with parsley. Check doneness of the rice. Add a bit more broth if needed and extend the cooking time by another 5 minutes (if necessary). Adjust seasoning. When ready to serve, add the crème fraîche and shrimp pieces. Mix well until evenly distributed. Turn off the heat, drizzle with lemon juice, cover and let stand for 5 minutes. Garnish with the reserved shrimp. 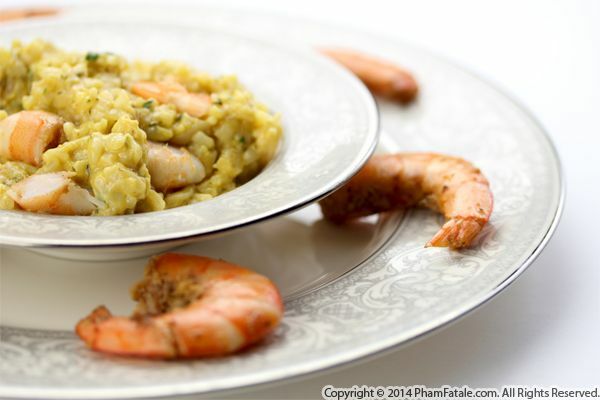 I like risotto al dente, not too mushy, so it still holds its shape and is also more appealing with the shrimp. The key is to add the liquid incrementally and never let the dish dry out, or the rice will burn at the bottom. Don't add too much paprika. It's used only for its color; you don't want it to overpower the shrimp. Published By: Jacqueline Pham on February 17, 2015.